Who Wouldn’t Be Thrilled To Own Any One These Beauties? Between 1924 and into the early 70’s the Zenith name was synonymous with innovation, style and quality. Due to the unerring devotion of Zenith’s founder, Commander Eugene McDonald, Zenith produced instrument quality sets which deep-pocketed consumers, including aviators and yachtsmen could depend on. Their iconic Trans-oceanic line spanned the tube and transistor eras and were not only status symbols but the embodiment of Zenith’s commitment to provide the very best…a standard by which others would be judged. The Royal 500 series of “pocket” radios were wildly popular, and set standards of quality and performance in that product category. They were the most copied radio ever made, but they were never matched by any imitator. In between the large Trans-oceanics and smaller 500 series radios was the 700 Series…the “Lunchbox Radios”, so named because of their size. There were over a dozen models in the series…a few of the lesser models featured 6 or 7 transistor chassis and a faux-leather covering called Permawear which has not held up well over the years. But for this article I’m going to focus primarily on the top of the line 700 models. All were top performers, featuring 8 transistor chassis, three-gang air-core variable tuning capacitors with vernier tuning and a tuned RF stage for top reception quality. All sport genuine leather-covered cabinets, a 4 inch speaker capable of strong, clear audio and run on 6 C cells which would typically power the radio for over 350 hours…that would be even better with today’s modern alkaline cells. 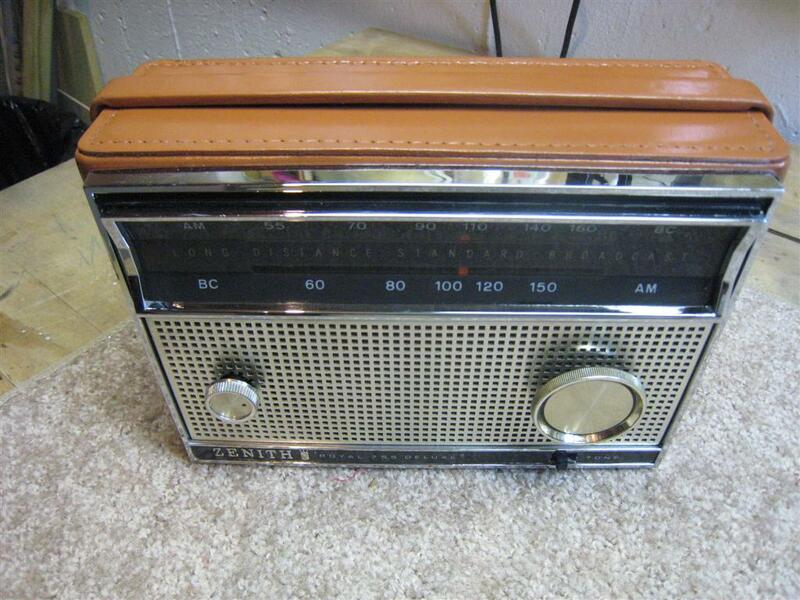 The first models appeared in 1957 – The Royal 700 with 7 transistors was available in Black or Brown leather and retailed for $69.95. The upgrade was the Royal 750 with 8 transistors, also available in black, tan and a relatively rare gray, selling for $79.95. Adjusting for inflation between 1957 and today (2011) those prices would translate to…hold your breath…over $540 and $615!!! 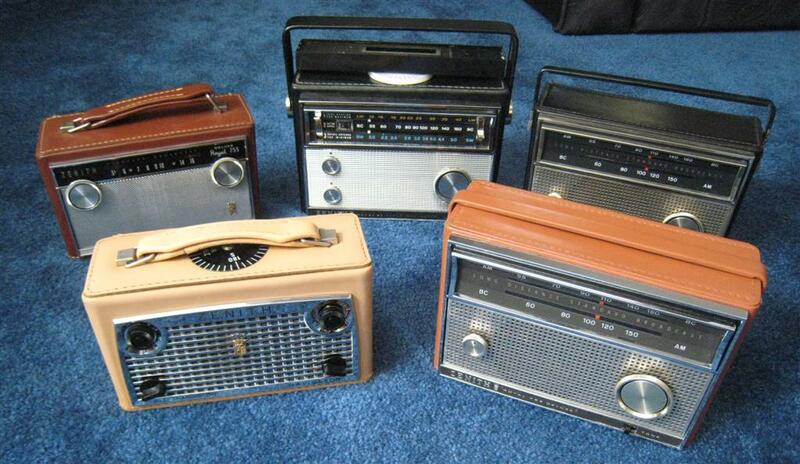 Yes…these were deluxe radios. 1958 brought the introduction of the first of the “Navigator” series, the model Royal 760 Navigator retailing for $99.95 ($777 in 2011 dollars). 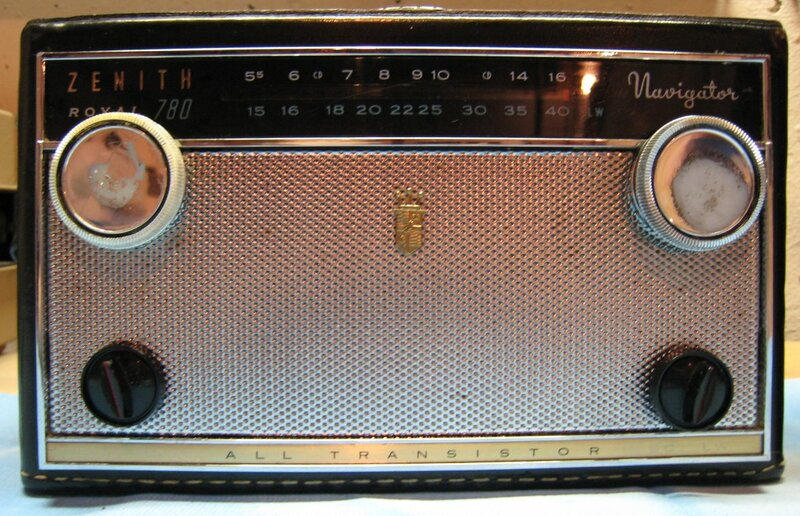 Its 8 transistor design was similar to the 750 but with the addition of the Longwave Navigation Band from 200 – 400 KHz and a “Normal/Navigate” switch. That switch disabled the AGC (Automatic Gain Control) circuit, which normally compensates for signals of varying strength to keep reception as constant as possible. By turning the AGC off, it was much easier to use the radio as a direction finder to home in on a navigational beacon or a local radio station…when you turned the radio to null the signal, it would be pointed directly at the transmitter. Zenith ads of the day showed yachtsmen and aviators carefully adjusting their Navigators to find their way home. 1959 ushered in the replacement for the 750, the Royal 755. The most striking improvement was the introduction of the slide rule dial which was much easier to read than the small circular dial of the earlier sets. Interestingly the 755 was available in three major variants, as the models 755 LF, LG and LK. (Zenith usually had many more minor variants within the major models with different chassis numbers, transistor complements and minor assembly differences. Many, but not all of these details are described in the service manuals and are of interest to the technician but don’t usually affect performance very much if at all). The three pictures above show the major versions of the Royal 755. 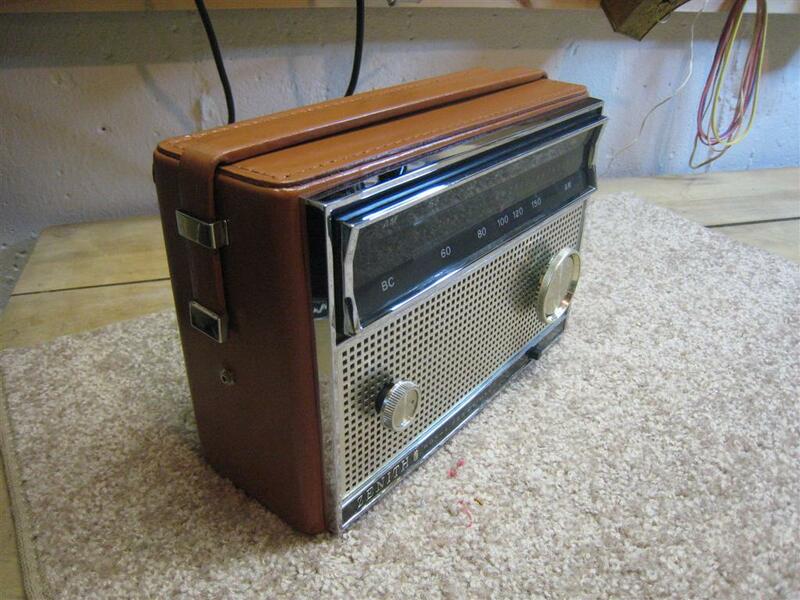 The first model, the LF had a large plastic handle which contained the ferrite rod and swiveled for best reception. 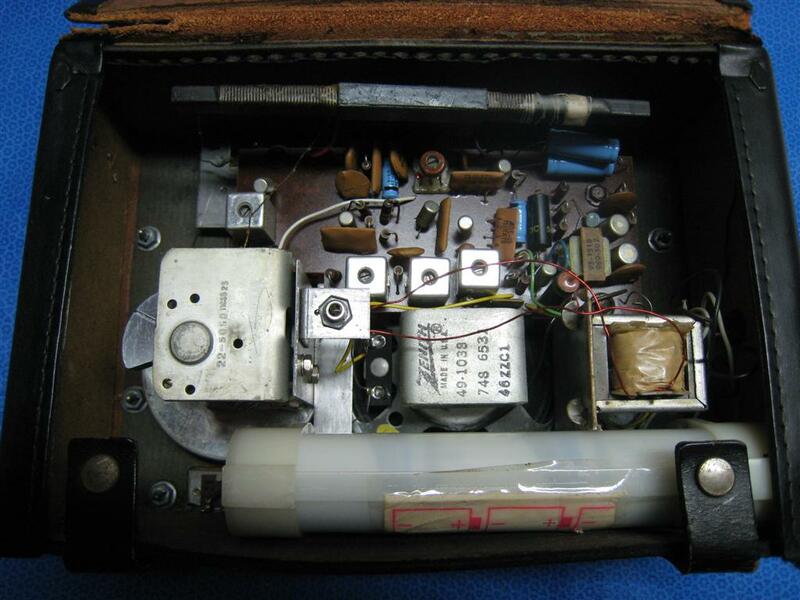 That’s a great feature, however it was soon realized that when the handle was grasped, the hand capacitance effect detuned the circuit and diminished reception, so the LF was soon replaced with the LG which moved the ferrite rod back inside the cabinet. The last version of the 755, the LK added a “Battery Saver” switch, which extended the already long battery life even further by reducing voltage to the audio circuits…while listening at low volume, battery drain was reduced even further. The Royal 760 Navigator was similarly upgraded to the Royal 780YG with the addition of slide rule tuning. This and all future Navigators were produced only in black. Later on Zenith would come up with confusing model numbers for their Navigator upgrades. The Navigator 790Y followed the YG and looked like the same radio but with a solid plastic handle once again housing the ferrite rod…with the same problem that reception was reduced when you were holding the handle. But a major upgrade occurred with the Navigator 790YM which was a completely different radio inside and out. The 790YM finally featured a rotating ferrite rod on top of the radio completely separate from the handle. It also added the 2-5 MHz Marine Navigational band, a dial light, a signal meter, a Hi/Lo Tone Switch, and the Normal/Navigate switch was enhanced by a variable gain control so you could adjust your signal for a specific meter reading after you nulled it, allowing even more precise direction finding. And with the rotating ferrite the radio could remain stationary while you used the sites built into the rotating antenna, making these last Navigators excellent navigational tools. 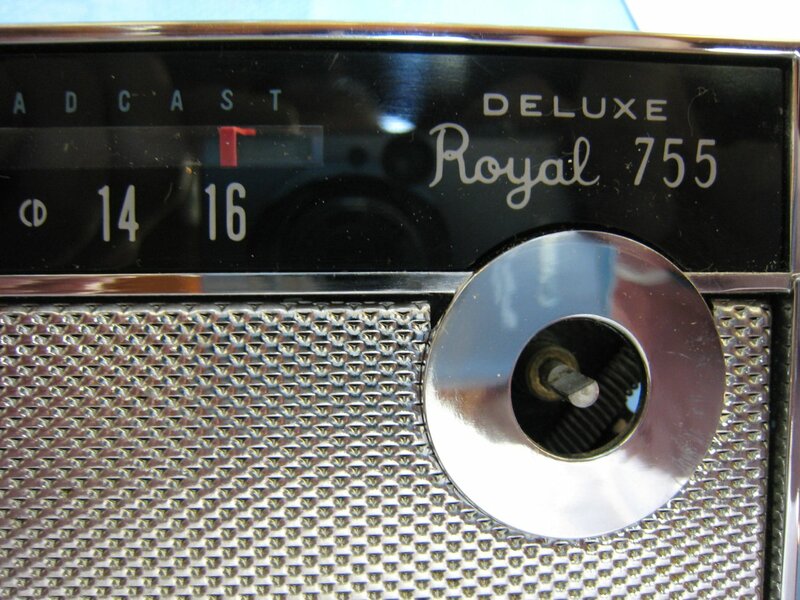 Later on the Royal 97 Navigator would replace the 790YM…with the exception of the model designation on the nameplate these radios look identical on the outside and perform similarly but have minor circuit changes. The Royal 755LK was also upgraded to the all new Royal 755M in 1965, using the same concept and style as the new Navigators. It added the Hi/Lo Tone Switch and by a small margin is the best performing of all the Zenith Lunchboxes. Available in Black or Tan it was a real bargain at $49.95. I should also point out that as I have worked on and researched vintage radios I have often seen manufacturers change the transistors and other components used in their sets but generally this was not done to change performance. They usually made these changes to utilize whatever components were readily available to them at the time. If transistor “X” became tough to find or more expensive, they would replace it with transistor “Y”, and make any circuit modifications needed to achieve the same performance. Sometimes this would be reflected in a new chassis number or would be documented in a new Service Manual or an addendum, but not always. The first Zenith lunchbox radio I got was a very nice looking 755LG…this is cosmetically as nice as any 755 I have seen. 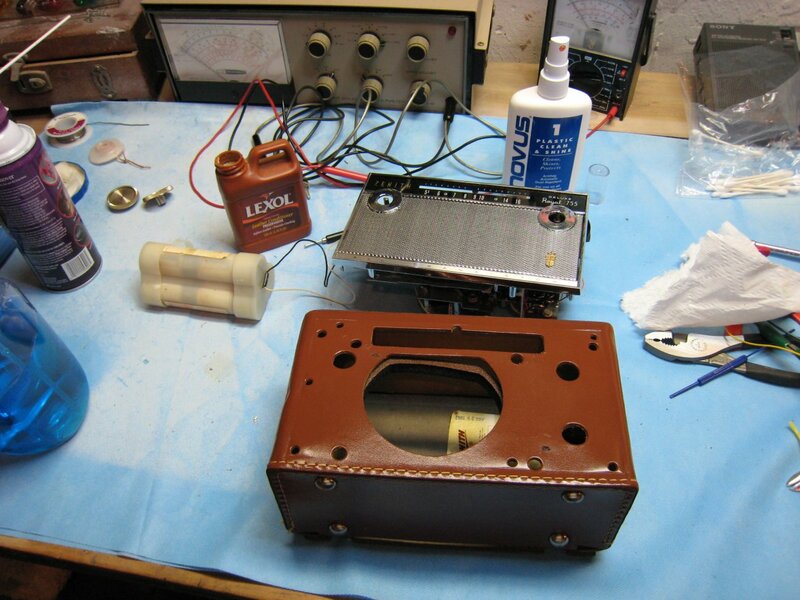 It had a badly deteriorated battery box (due to battery leakage and very common in these old radios) and although I was able to grind the rust off its contacts and make it work, there was so much metal worn away that I eventually replaced it with a battery box from a parts donor set. The radio was still playing very poorly though…weak audio and reception, similar to what you might expect with weak batteries. Fortunately this is usually easy to remedy in these radios by replacing the electrolytic capacitors…the single most failure prone device in them. This radio has only four in it and disassembly is easy for access to them. 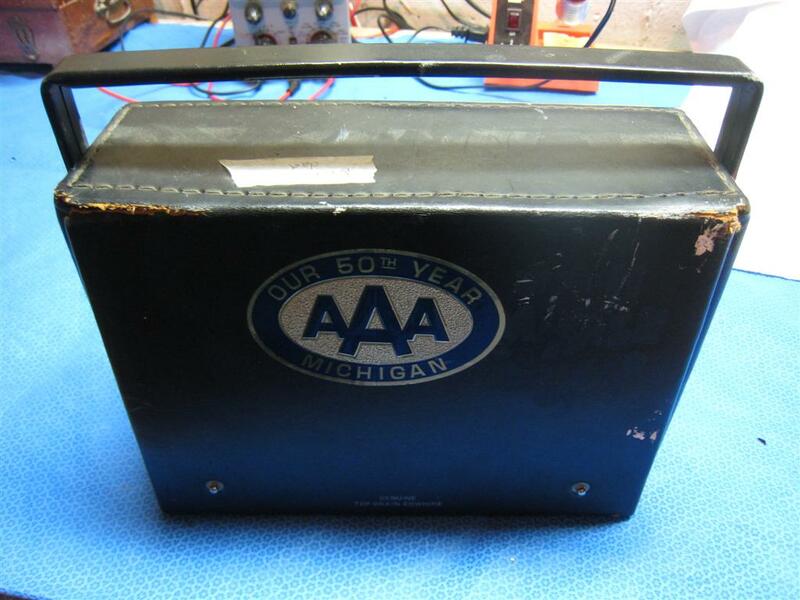 At the time I first worked on this radio I unfortunately did not have a capacitor checker, but it was fairly simple to replace those electrolytics, then check for proper operation after each one was replaced. (This is good practice to be sure you don’t make a mistake which might be harder to find later – don’t ask me how I know). The radio improved when its caps were replaced…that was gratifying, but although it seemed to be essentially working normally I had a nagging suspicion it wasn’t quite right. Even after alignment it was slightly weaker than others I later compared it with and sometimes there was thinness to the sound or a tinge of distortion which seemed not quite right, although it was subtle and elusive…I even substituted some of the transistors and another speaker but the subtly weak audio remained. What really attracted me to it is that it can measure an electrolytic cap without removing it from the circuit and it has therefore paid for itself in more efficient use of my time many times over. In the case of my 755, I learned that one of the replacement caps I had put into it was bad! I replaced it and for the first time heard that radio play loudly, clearly and as strong as it is supposed to. I would probably never have replaced any of those caps a second time and thus would never have gotten this radio working properly without the ES88A. Strongly recommended! as needed until there is no further improvement…it is worth the effort to get it as good as it can be. 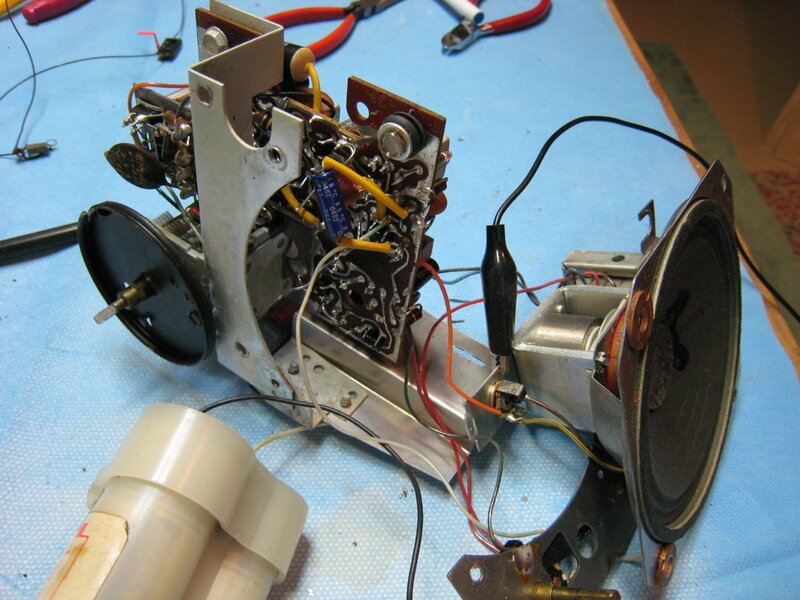 Note that when the chassis is disassembled as shown it is necessary to use clip leads to connect the chassis parts together or the radio will not function. It is often worthwhile to clean and recondition the leather. Use only products specifically designed for leather…they will clean it without damaging it or removing its natural moisture. 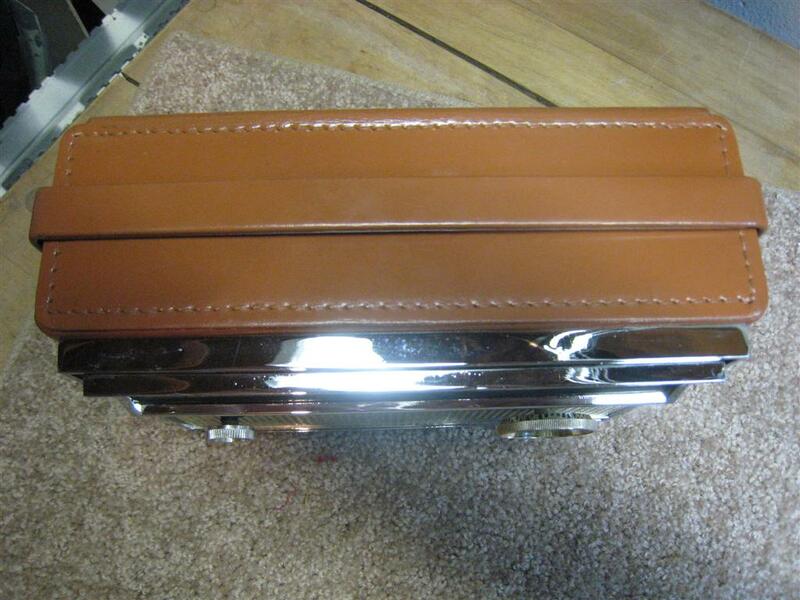 I also strongly recommend conditioning the leather to enhance its appearance and durability. Over the years leather dries out, becomes brittle and can crack and break. I like Lexol but there are many excellent leather products that will do the same thing…add natural moisture back into the leather. It will absolutely drink it up at first. I like to do this while the radio is disassembled but this is not essential. Apply it liberally and let it soak in. Apply it again (and again if needed) until it has absorbed as much as it can and it remains wet. Pay special attention to the leather handle (I use cotton swabs to get it into the loop at each end), the flexible area at the top of the back where it flexes when you open the back and those tabs at the bottom which snap to open and close the back. I soak those on all surfaces. Let it all sit for a while, and then wipe off as much excess as you can with a rag. The result will be much more lustrous and supple than when you started, and if it has not already cracked it will actually be stronger and much less likely to crack in the future. Next up was a 780 Navigator. Operationally this radio appears to be a Royal 755 with the addition of the LW Navigational band and the Nav/Normal (AGC Defeat) switch but internally the extra band and band switch add a bit more complexity. Still, it is relatively easy to disassemble and service. This radio was working pretty well as received but the band switch and Nor/Nav switch were very intermittent so a bit of De-Ox-It (http://www.caig.com/) was used to return them to solid operation. I replaced only one cap in this radio……the audio coupling cap in series with the volume control wiper and audio driver stage. Alignment proceeded routinely but with some additional adjustments needed for the extra band. 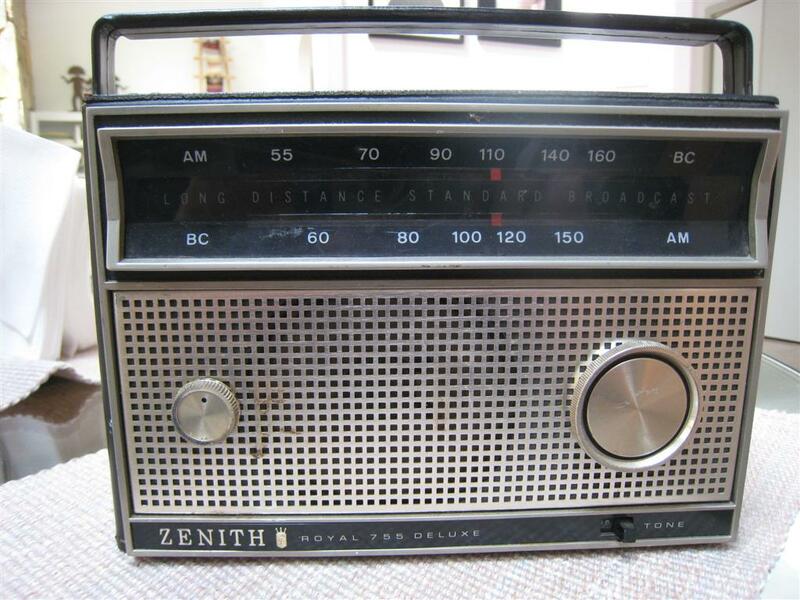 After I had owned these radios for a few years my son and daughter-in-law presented me with a rather beat up looking Royal 755M…her grandfather had owned a Zenith TV-Radio shop and there were few goodies found when they were cleaning it out after his retirement. (They later gave me a NIB (New-In-Box) R-7000-2 Trans-oceanic . I had never seen the 755M before and I had never looked for one, primarily because one of the leading Zenith Collector’s Guides, “Zenith Transistor Radios” by Norman Smith (Schifferbooks.com) had described it as a cost-cutting step backwards in design and performance. *(See note) However, when I started to check this radio out I found that ugly as this sample was on the outside, it was nice on the inside. It still featured a premium metal chassis, 8 transistors, a three-gang air variable tuning capacitor and a tuned RF stage. Even better, this radio had been repaired because it sported a new battery box and some of the electrolytics had been replaced. Evidently someone brought this in for repair and never picked it up…it must have sat there for years…their loss. Well let me tell you…I was not prepared for what this radio could do. I put 6 new alkaline C cells in and turned it on and its dial was filled with strong signals. My familiar weak out of town targets were all there, loud and clear. Some quick side-by-side comparisons with my 755M and my other good AM portables revealed that this 755M was better than the earlier 755’s in both reception and sound quality. In fact, months later, after having compared it with every good AM portable radio I own, I can tell you that this is one of my “Top Tier” choices in AM radios. While not quite as selective as the best modern sets (the IF is a bit wide on all these vintage radios), it is almost as sensitive as it gets on AM…only a few reference portables can do any better. The 755M was later replaced with the virtually identical Royal 74. *How could Norman Smith, who has provided us with an otherwise excellent book on Zenith portable radios, make such a glaring error? My guess is that the book is a combination of his personal experience with a few models and scads of research of Zenith company records, and that somehow, the wrong info slipped in on the 755M. I also ran into at least two sets where one of the leads from the ferrite rod was broken away from the PCB or the tuning gang. The problems may have been due to poor soldering but those wires are exposed and relatively easy to snag so beware when you’re going inside one of these, such as when changing batteries. If you have one that seems very insensitive check the solder connections where the ferrite leads are connected to the PCB and the tuning cap. A good friend of mine who is an avid collector/restorer soon obtained several samples of these, in both black and tan, and we found that once recapped as needed and aligned all performed as well, so this was no fluke. Through him I was able to eventually obtain a nicer cabinet to replace that beat-up, sticker-adorned original one, as well as a tan set, but in a rather worn out, faded and stained leather cabinet. After some quick research I located a shoe repair shop where the owner was experienced with leather dying…he makes a big business out of changing the color of women’s shoes and handbags. He happily took on the job of re-dying the leather cabinet for the grand sum of only $20…now my tan 755M looks brand new…I was thrilled with the result. The last set I worked on was a Royal 790YM Navigator…the totally redesigned model which is the big brother of the Royal 755M. This radio was a great case study to illustrate some of the unexpected stumbling blocks one can run into when working on vintage radios. I found it on eBay for a low price but it was described as working perfectly. When I received it, the batteries were still in it and it was indeed working…but not what I would call perfectly. It was obviously weak and needed some help but other than a broken switch lever tip (very common on these)…be careful when you lay it on its face to change batteries) the cosmetics were not terrible. I could see that some of the electrolytic caps had already been replaced by the previous owner so before a complete alignment I tried a few quick alignment adjustments and found I was able to get more out of it than I was getting…it seemed very likely that a routine alignment might restore it to full performance. I disassembled the radio to go through it thoroughly and to detail the cabinet and discovered that it is necessary to remove the rotating ferrite rod from the top of the cabinet because its many leads will not reach the radio once its chassis is out of the cabinet unless you do so. No problem…usually. Stumbling block number one: The swivel mount for the rotating antenna had been broken and glued in place. Aargh! I had to remove it to align the radio completely, but I didn’t know if I would be able to get it back so that it would still swivel properly. Luckily the glue chipped away cleanly so no further damage was done and I could then see the problem…most of the plastic collar which holds a retaining C Clip was broken away. Much later, after all repairs were complete I was able to re-glue that broken part back together. If not I would have been forced to obtain a parts set to fix it. With the radio thus apart on the bench I was ready to do the alignment and detail the cabinet…but first I was to face another problem. Stumbling block number two: The radio was now totally dead! “What? All I did was take it out of the box…why won’t it work now?” The dial light still worked so I knew it was getting power…in fact…the output transistors were getting dangerously warm as soon as I turned the thing on so I quickly cut the power. I stared at it like a dummy. I spent quite a bit of time looking for something I might have inadvertently disturbed, like a shorted wire, something touching something it wasn’t supposed to. I did some basic ohmmeter checks to look for obvious shorts… I disconnected parts of the circuitry to isolate a short…everything looked fine. Well, they say two heads are better than one, and luckily for me, my collector/restorer friend is much smarter than I. He looked at it and soon discovered the most curious thing – the previous owner had wired the battery box backwards. We deduced he must have known this and installed the batteries backwards as well so the radio would work. That’s why it arrived with batteries in it. Of course, after I removed them to take the radio apart, and put them back in properly, the polarity was reversed. Sure, it was a simple problem, but it was one I wouldn’t have thought to check for since the radio had worked when I received it. It absolutely galls me that whoever did this, KNEW what he had done and chose to leave it that way rather than to fix it properly…or at least to tell me…not nice. Lesson learned…take nothing for granted. Listening test and comparisons: OK. So how do the Zenith lunchboxes stack up against my other favorite AM portables? They are superb. Zenith designed them to be very sensitive and all of them do very well at hauling in weak AM signals. As I mentioned earlier, they are not super selective…I would judge their IF passband to be in the neighborhood of 7-8 KHz which is a hair wider than on most modern radios…for comparison the Eton E1 offers bandwidths of 2.3, 4 and 7 KHz but most typical radios are 4-5 maximum. This wider bandwidth does allow for crisp audio which you don’t get with narrower bandwidths, and the Zeniths are still selective enough to separate our US 10 KHz-spaced signals reasonably well, unless the desired signal is much weaker than the interfering one. In that case a radio with a tighter bandwidth will separate them better but for most general listening you will probably like the bandwidth Zenith chose. The radios also improved incrementally as the models progressed…my 755 is a bit better overall than my 760 which pre-dated it, and the 755M is slightly better than all of the earlier 755’s. The “M” also has bigger, fuller audio quality and the tone switch too, along with a leather-covered metal handle which I trust more than the 50 year old leather handles on the earlier models…I’ve seen them break. The last Navigators – the 790YM/97 with the rotating ferrite antennas) offer features not found on the 755M but the 755M has a VERY SLIGHT superiority at raw AM sensitivity (very tough to notice in most cases) and has thus become my favorite of the Lunchbox series. I compared the 755LG and 755M with some of my best portables…what I call my Top Tier” AM radios. They include the Panasonic RF-2200, GE Superadio I and II, GE P780, Sony 2010, CC Radio 2, CC Radio EP, Sangean PR-D5, and a few others. In terms of raw sensitivity (the ability to bring in weak signals with a minimum of circuit hiss) the 755M essentially matches these reference radios – the790YM/97 Navigators are very close, and the 780YM Navigator and 755L are just a small notch behind them. It’s important to note that in order to be able to hear these sometime subtle differences, you have to be in a very low noise environment, where the radio’s own noise floor becomes the limiting factor. In many homes today the noise level is much higher and the differences in sensitivity among these radios will not be obvious. Also listening at night when overall signal levels on the AM band are much higher these differences may be harder to discern. There are of course many other factors that influence listening quality. 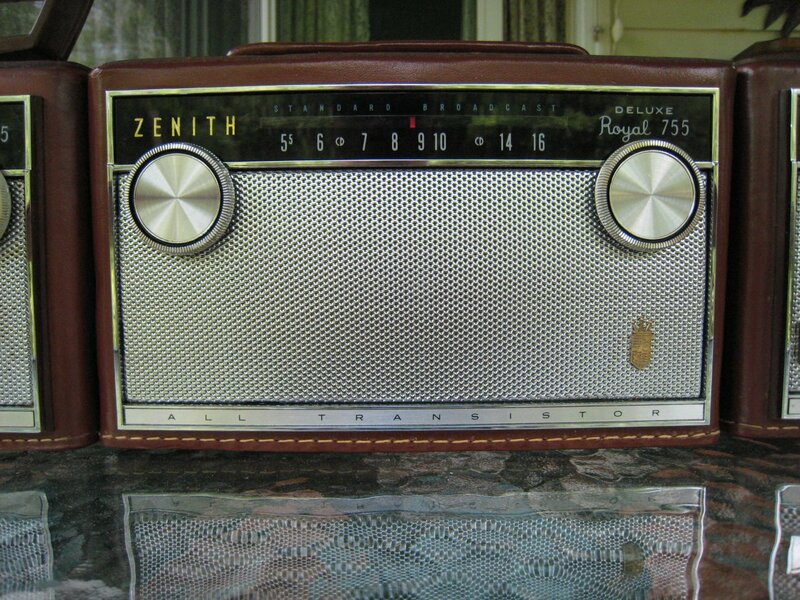 I mentioned that the Zenith’s are not quite as selective as the best radios. Most of the other radios listed here do a slightly better job of separating a weak signal immediately adjacent to a stronger one but for most general listening this is not much of a problem, although hard-core DXers will look elsewhere. However, if you live in some metropolitan areas where there are many extremely powerful signals, the ability to handle such mega-signals without overloading may be the most important determinant of reception quality. In that case, the Zenith’s will do very well as will the other vintage radios listed here…many of the newer radios suffer in that comparison. 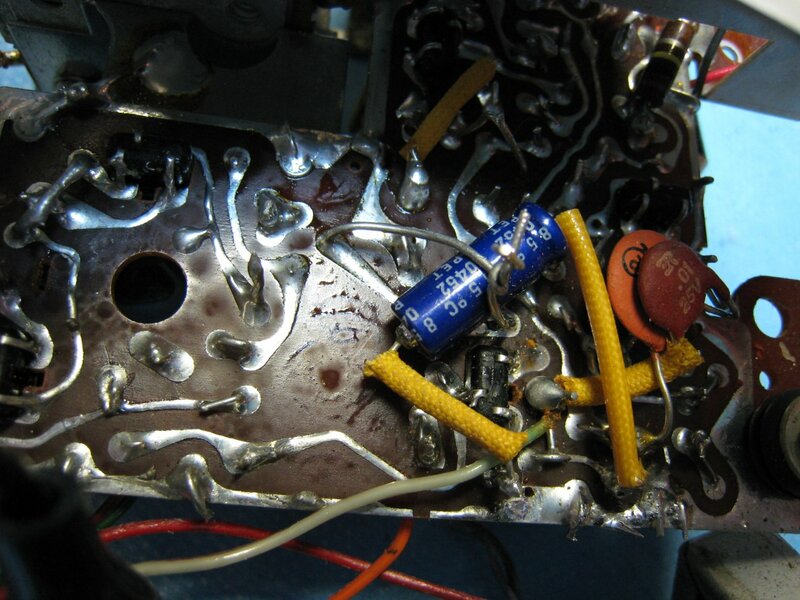 The 8 transistor Zenith’s in this review which all feature a tuned RF stage have excellent RF dynamic range…the ability to receive weak signals with a minimum of noise along with the ability to handle strong signals without overload which can splatter signals all over the dial making reception of other signals impossible. Overall these Zeniths are great performers and acquit themselves well among the many vintage radios I enjoy…they’re easy to work on and can usually be found on eBay for reasonable prices. I hope you’ve enjoyed this journey through the Zenith Lunchboxes with me…I strongly recommend that book mentioned earlier (“Zenith Transistor Radios” by Norman Smith as a great guide to all the Zenith Transistor portables. Zenith As I said there are a few errors in it which I’m sure are unavoidable, and the author’s love of the Royal 500 series somewhat overshadows the fact that the 700 series were the top of the line AM portables, but it still stands as a wonderful reference guide to Zenith transistor portables and I like to refer to it over and over again.